LPG systems have been around for decades. “I’m putting my car on gas” is something that has been said for years by caravan owners, those with big V8s and commercial vehicle owners. Trouble is, while there have been savings in fuel costs, ‘gas’ cars have also had a long and well deserved reputation for poor tailpipe emissions, lousy performance and crap reliability. In fact, years ago I had a standing bet with my partner that if we saw a late model car stranded by the side of the road with the bonnet up, it would have an ‘LPG’ sticker on the number plate. I usually won the money. But oh boy, have things now changed! Instead of a restrictive venturi placed in the intake system (sucking away performance on both gas and petrol), electronically-controlled gas injectors are now used, posing no restriction to the engine. Instead of bodged-up and intercepted oxy sensor signals, now the original petrol engine management system works with almost entirely normal functionality – even to the extent that full OBD fault codes and OE diagnostics are still valid. So is the story all good? No, there are still some disadvantages but for many people, these are now well outweighed by the cost savings possible. To get the good gear on vapour gas injection, we spoke to John Parnell of Parnell LP Gas Systems. Sixty-five year old John has been developing automotive LPG systems all his working life and has a wealth of experience in an amazing variety of gas systems. He believes the company’s current system to be head and shoulders above any gaseous LPG system he has used. 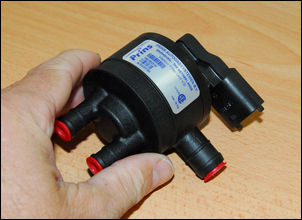 The system uses components primarily developed by Prins Autogassystemen BV of The Netherlands. 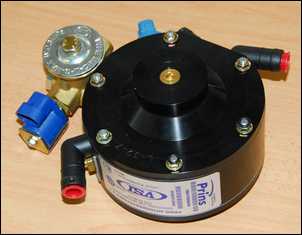 Prins supplies the dedicated LPG ECU, the wiring loom, regulator/converter and filter/sensor assemblies. However, the most important parts of the system – the injectors – are manufactured by Keihin, a Japanese company with close links to Honda. Because the performance of the system is very much based on how these injectors work, it’s worth looking at them more closely. 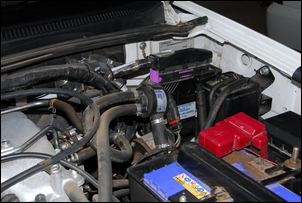 The injectors are of the peak-and-hold design, drawing 4 amps at peak and 1.5 amps in the hold phase. They can be pulsed at frequencies of 50 – 400Hz and can operate in a temperature range of -40 degrees C to +120 degrees C. Their resistance is 1.25 ohms and they have an inductance 3.5mH. Maximum fuel pressure is 3.9 Bar (57 psi). However it is one specific aspect of the injectors’ performance that makes them suitable for the control system that will be described in a moment. That aspect is the linearity of their flow versus the injector opening time. As this graph shows, from a pulse width of about 4 milliseconds up to 24 milliseconds, the flow of the injectors increases linearly. In this regard they are similar to petrol injectors. 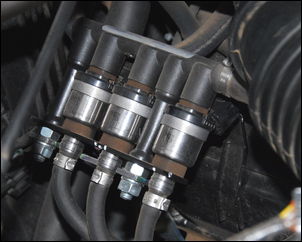 Now if the gas injectors behave in a similar way to petrol injectors, to provide the correct gas fuelling all that needs to be done is to apply a constant correction factor to the signal that would normally operate the petrol injectors – and use that corrected signal to operate the gas injectors! For example, at idle the petrol injectors might need a pulse width (opening time) of 2.89 milliseconds to provide the right air/fuel ratio. In the same conditions, the gas injectors might need an opening time of 3.29 milliseconds – some 13.8 per cent more. If this 13.8 per cent greater opening time of the gas injectors provides the right gas fuelling, the same proportional increase in gas injector duty cycle will also work at other engine loads. Because, like the petrol injectors, the gas injectors have linear behaviour, such a simple approach will provide very close to the correct fuelling. In fact, the gas ECU can be programmed to have the gas injector correction curve altered in gradient by the simple means of altering the idle and full load numbers. A straight line is then drawn between these points. Remember, the gas ECU is using the variable duty cycle signal normally provided to the petrol injectors and is then simply applying a certain correction to the length of time the gas injectors are open for – the tweaking of the line on the graph just alters this correction relationship. Now you might wonder if such an approach will be sufficiently accurate. But there’s another string to the bow. Because the car’s closed-loop system still works as it did originally, if the gas supply is incorrect at any point, the ECU will self-learn a changed duty cycle at that load point. It ‘thinks’ it is operating the petrol injectors but in fact this signal is just being used by the LPG ECU as its input in determining the LPG injectors’ duty cycle – but the outcome is the same: changed mixtures at the point needing correction. When setting up the LPG control system, a proprietary OBD scanner is used to look at the car’s short term fuel trim. If, after the swap to gas, this shows that major short term learning is occurring (ie the car is using the feedback of the oxygen sensor to change the mixtures) then the gas fuelling needs to be better matched to the engine. The LPG ECU also has inputs from an engine coolant sensor (positioned on the converter), gas pressure and temperature sensors (positioned on the filter), the original oxy sensor(s), and the engine crank-angle sensor (ie rpm). 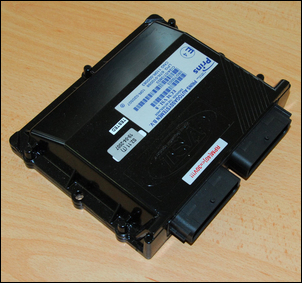 The ECU can be mounted in the engine bay. The LPG control system also provides an ‘injector replacement’ signal to the original ECU so that when the petrol injectors are switched off, no fault codes are generated. The huge advantage of taking this approach to controlling the gas injection is that all the factory petrol engine management logic remains in place. That includes aspects such as over-run fuel cut-off, rev limiter, traction control engine power limiting, full throttle enrichment and so on. The ignition timing is not changed when running on LPG. Parnell LP Gas Systems has in development a system suitable for turbo cars. It’s currently being trialled on a Falcon XR6 Turbo. Contact the company for the latest information on this development. In operation, the car always starts on petrol. This is primarily because there is minimum coolant temp below which the converter cannot function in converting the liquid LPG to a gas. A short time after the coolant has reached the minimum operating temperature (both the time and the temperature are programmable), the LPG control system automatically switches off the petrol injectors and turns on the gas injectors. 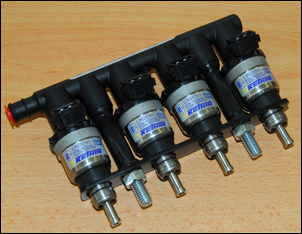 If the original petrol injectors were fired sequentially, so will be the gas injectors. The driver is provided with a small dash-mounted interface unit. This combines the function of LPG fuel level gauge, gas/petrol changeover switch, warning beeper and fault code indicator. The LPG system can log about 50 faults, including stalling on the switch to LPG, gas temp too high or too low, gas converter slow to warm up and ‘missing’ at high revs. A particularly interesting fault that is logged is when the gas system pressure falls to less than 1.25 bar within 4 hours of the engine being switched off – indicative of a gas leak. The gas tank is conventional and contains a level transducer and external electronic solenoid lock-off valve. The gas then flows to the converter / pressure regulator that changes the LPG from liquid to gas and regulates it at 2.2 Bar (32 psi). (This pressure is adjustable but is set by the installer and then not altered further.) The coolant temp sensor for the LPG ECU is placed on the converter. From there the gas flows to the filter assembly that uses a combined sensor for gas temperature and pressure. The gas temperature can vary with ambient and under-bonnet temp variations, while the gas pressure (although ostensibly regulated by the converter / regulator) can also vary, eg dropping with a sudden throttle opening. 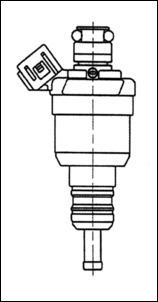 The injector block (or blocks – on V engines, two blocks are used) are mounted close to the intake manifold. Short hoses connect the injectors to the fittings tapped into the inlet manifold. 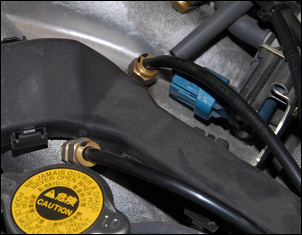 If these fittings are by necessity distant from the petrol injectors, plastic hoses are placed inside the intake runners to allow the gas to exit close to the inlet valves. 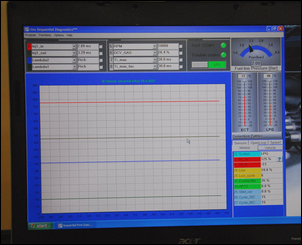 The system is calibrated for the car by a laptop software package. 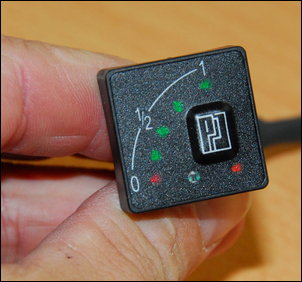 This also allows fault diagnosis and graphing of sensor outputs. Since the LPG system switches over to gas shortly after starting, very little petrol is used. This can lead to problems with stale fuel – John Parnell suggests that after 3 months, the fuel’s characteristics will have noticeably changed. He suggests that every third tank of LPG, the owner should run the car on petrol for 10 minutes, thus using up the petrol much more rapidly. So if aftermarket LPG has progressed to this extent, is there are any bad news? John Parnell was frank. More serious is the rise in fuel consumption. John Parnell says that typically fuel consumption on LPG rises by 15 – 20 percent. “That’s more than our competitors will tell you but it’s what I have seen on the emissions test cycle,” he said. To be legally able to be fitted, the LPG system must provide the same or better tail-pipe emissions as the standard car achieves on petrol. 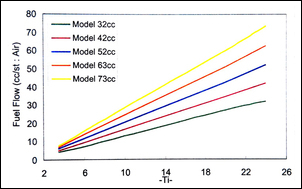 These tests are, in the case of Parnell LP Gas Systems, ‘hot’ tests done on the IM240 cycle – 240 seconds of a rolling dyno test replicating mostly urban conditions. 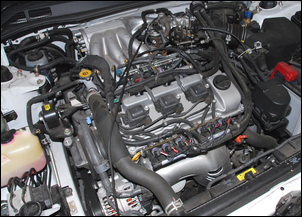 John Parnell provided us with the test results of a VZ Holden Commodore V6 fitted with the sequential electronic injection LPG system. As can be seen, all measured emissions either decreased or stayed the same. Interestingly, in this case the measured fuel consumption on gas was actually better than on petrol – 12.5 litres/100 on petrol and 11.7 litres/100 on gas, a decrease of 6 per cent and (as expected) a very close mach for the drop in CO2. We went for a short drive in a 2005 Camry V6 fitted with the gas injection system. The transition from LPG to petrol (and vice versa) was so smooth as to be largely unnoticeable, and the car retained identical driveability and idle speed control whatever the fuel. The owner of the car (an employee of Parnell LP Gas Systems) suggested that if gunned off the line, the car could have a small initial flat spot (perhaps caused by the long injector-to-manifold gas hoses of this installation) but we noticed absolutely zero driveability issues. As always, the economics of a gas conversion depend on how many kilometres the car will do and the relative cost of LPG and petrol. With the current Australian government reimbursement of $2000, you’ll be about $1800 out of pocket to have a full Parnell electronically controlled vapour gas injection system fitted. Remember to factor-in an increased fuel usage of 15 – 20 per cent and then do the calculations. With factory driveability and only a trivial power loss, we think it’s now purely a matter of economics – the system works absolutely fine.